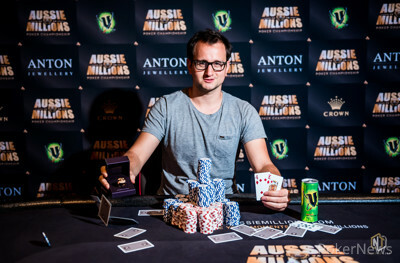 Rainer Kempe has won the 2019 Aussie Millions AU$25,000 Challenge for AU$826,465 after a heads-up deal. Kempe battled to the top of a record 151-player field to clinch victory in the event shortly before 4 a.m. local time. 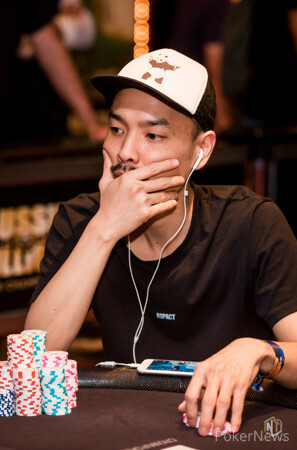 Kempe chopped with 2018 Aussie Millions Main Event winner Toby Lewis after they got past 2019 PCA champion Chino Rheem three-handed. 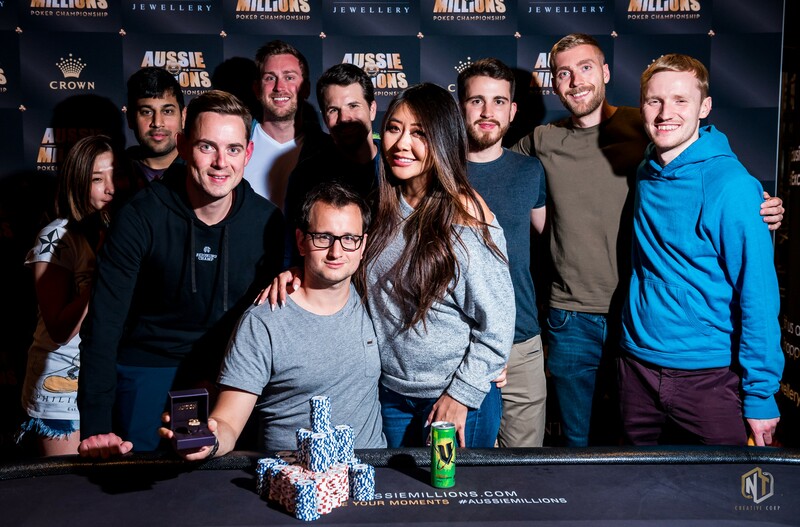 A little over four years after finishing second to Michael Soyza in the 2015 Accumulator event, Kempe finally has his hands on an Aussie Millions ANTON championship ring of his own. Kempe moved over $19,000,000 in total live earnings in the process. "It's really cool," remarked Kempe shortly after his win. "I was kind of close to winning an Aussie Millions ring in one of my first live deep runs so it's nice to close this one out, so that's awesome. "I'm going to play the AU$50,000 tomorrow most likely. Then there's the Main Event. My whole family is here having a delayed Christmas so I might be fine with maybe not making a Main Event deep run, but I'll try." Play resumed on Day 2 with 29 players remaining and only 17 places paid. Big names were heading to the exit early, including Alex Foxen, Sorel Mizzi, Vojtech Ruzicka, Robert Heidorn and Koray Aldemir. However, the eliminations slowed to a trickle as the money bubble approached, with several players nursing short stacks in the hope of locking up a min-cash worth AU$63,420. There were doubles for Kempe, Rheem, Sosia Jiang and Jack Sinclair before the bubble eventually burst — in two places. Najeem Ajez ran top pair into the pair and flush draw of Salter, with the Brit rivering trips while Jack O'Neill shoved with ace-king, only to get called by the pocket kings of Kempe, rejuvenated from his previous double. The pair split the min-cash, each taking home AU$31,710. With that, the floodgates opened. The first recipient of the full min-cash worth AU$63,240 was Matthew Wantman along with Elliot Smith. Kitty Kuo managed to sneak into the money with only two big blinds and was next to go in 14th place, followed by Sinclair. Following the O'Neill elimination, it was Kempe who led the final two tables, followed by Gautam Dhingra and Salter. Jiachen Gong, Jiang and Martijn Gerrits were all eliminated before the dinner break, with Dhingra overtaking Kempe at the top of the counts with nine players remaining. "For some reason at 10:30 to 11 just after the dinner break a lot of people were tired," Kempe told PokerNews. "They were talking about ending this early." 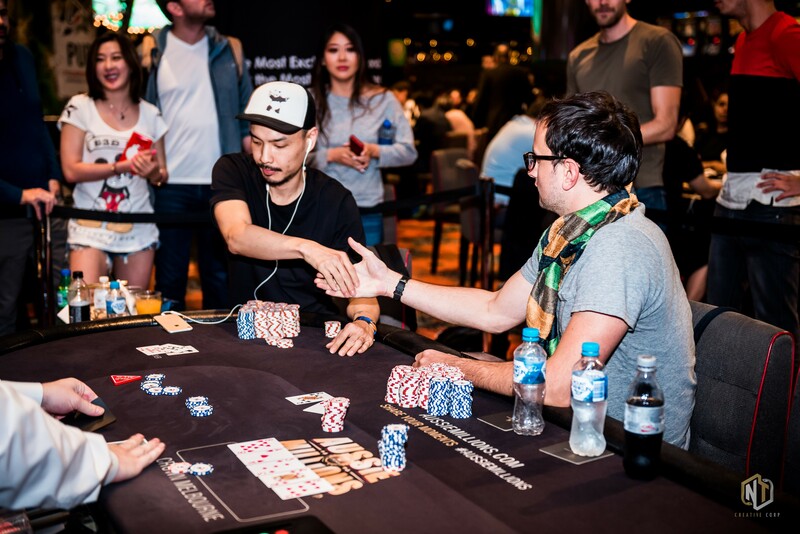 But play continued, as Japanese duo Hideki Izutsu and Kazuhiko Yotsushika busted in quick succession bringing the tournament to a final table of seven. 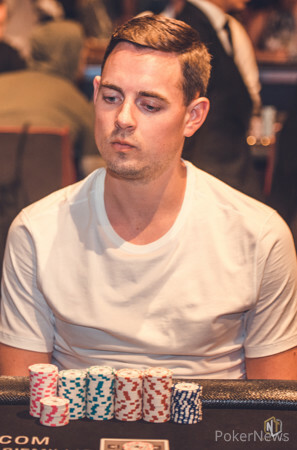 Salter came into the final table as the short stack, and failed to run it up, eventually shoving his last 12 big blinds into Luke Marsh who sent his fellow Brit to the rail. However, Marsh would be on the receiving end of another pivotal pot as Rheem scored a huge double with pocket threes to jump into the chip lead and leave Marsh short. He wouldn't recover and would bust shortly thereafter taking home AU$154,020. Long-time chip leader Dhingra had been sitting pretty for long periods but suffered a disastrous series of pots, including doubling up Lewis before losing out to Guillaume Nolet. Getting it in with ace-king, Dhingra flopped the nut straight, but his opponent rivered a backdoor flush to eliminate Dhingra in fifth for AU$217,440. All four remaining players had periods in the chip lead, but it was Nolet who would bust next with Rheem cracking pocket nines with ace-ten to wrestle the chip lead back his way. "Once it got short-handed it didn't feel like anyone was looking back," Kempe explained afterwards. "They just wanted to win this thing. I felt fairly comfortable the whole way. Clearly three-handed with 50 big blinds a lot of the cards are going to play themselves and I'm just glad I won the big flip against Chino." And it was a big flip, pocket nines cracked for the second elimination in succession by Kempe's ace-queen. Play resumed and a hand was dealt, but the hand lay dormant as the numbers were crunched. After the deal was agreed, which saw chip leader Kempe walk away with the majority of the prize pool, the hand that had been dealt was run out and Kempe emerged victorious. Following the deal, both Toby Lewis and Rainer Kempe agreed to go all in blind on the following hand, which had been laying dormant during the discussions. "Imagine if this is a cooler!" said Kempe as the cards were turned over. The board ran out with Kempe turning a pair to seal the victory shortly before 4 am in the morning. Last year's Main Event champion Lewis takes home AU$786,214 in prize money. "Ok - you win," said railbird Kitty Kuo. "Now we sleep!" 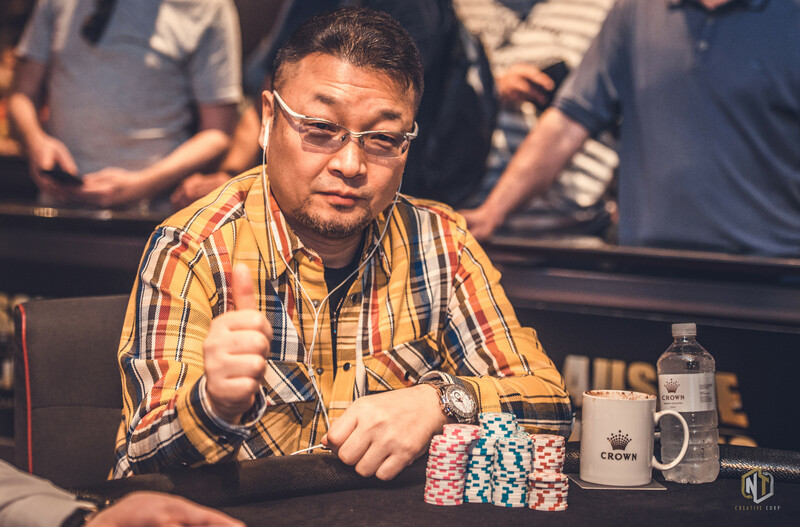 Chino Rheem opened to 175,000 and Rainer Kempe three-bet to 460,000. Rheem four-bet all in for 1,900,000 and Kempe called. Toby Lewis raised to 125,000 on the button and Rainer Kempe called in the big blind. The flop landed and both players checked to reveal the on the turn. Kempe bet 220,000 and Lewis called as the completed the board on the river. Kempe bet 420,000 and Lewis called. Kempe tabled his , but it would be Lewis' that would earn him the pot. On a turn, Toby Lewis checked and Chino Rheem bet 125,000. Lewis check-raised to 425,000 and Rheem called. The river was the and Lewis moved all in for 1,150,000. "If you got it you should have checked," continued Rheem. "I only have one pair Toby. That's all I have." "You made me sweat that one," said Lewis. "I almost called you with one f*cking pair," said Rheem. "I believe you!" replied Lewis. Toby Lewis raised the button to 90,000 and Rainer Kempe called from the big blind. Kempe led out for 135,000 and Lewis called as the river of the went check, check. Kempe tabled his and Lewis mucked. On a board Chino Rheem bet 135,000 and Rainer Kempe called. The river was the and Rheem checked. Kempe bet 260,000 and Rheem winced, thought a while, and then called. Kempe showed for a rivered straight and Rheem mucked.